Jordana Seals it With a Kiss. Jordana wanted to seal the deal with a kiss. How do you put a kiss on your husband to be’s wedding ring? 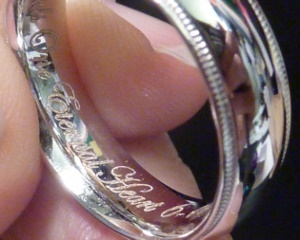 You get your wedding ring designer or favorite jeweler to get it engraved inscription-style inside his ring. New laser engraving technology allows creativity beyond just room for more words and more font choices in inscription engraving. With laser engraving you can put in a simple symbol or picture. Jordana saw where someone had engraved their child’s fingerprint inside a ring and was inspired to be the first to engrave a kiss! See my blog post about the different types of engraving to compare the different styles of engraving and the effects they create. 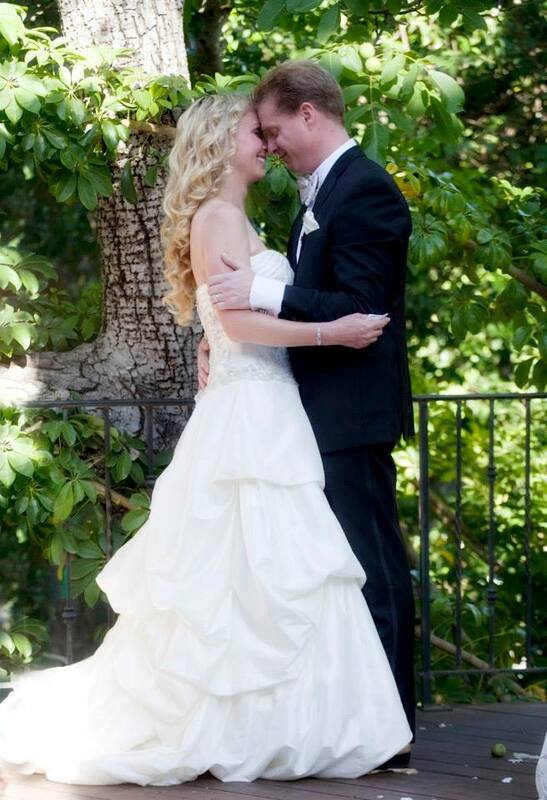 Jordana dreamed up this idea of a kiss inside her honey’s ring and here’s how you can do it too! 1. Locate a jeweler who can do laser engraving, especially images. 2. Locate fingerprint type paper that is very sensitive to the image printed on it. 3. Get an inkless fingerprint pad. 4. If you didn’t find fingerprint paper, get very high quality white paper. 5. Take multiple lip prints of your upper and lower lips. 6. Look at the prints and ensure that the outline of each lip is very clear. 7. Your jeweler will need to simplify the number of lines of your lip print. 8. 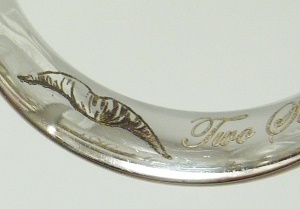 It is easier to see the engraving image if you chose either the upper or lower lip because the thinness of the area to be engraved makes the full two lip engraving less articulate looking. 9. Add a written message with your kiss to also be laser engraved. 10. Allow added time for laser engraving as your lip print must be entered and simplified in a computer program before the engraving can take place. Having that inner engraving sets your ring apart from others. Many times the fellas want a simple gold band. 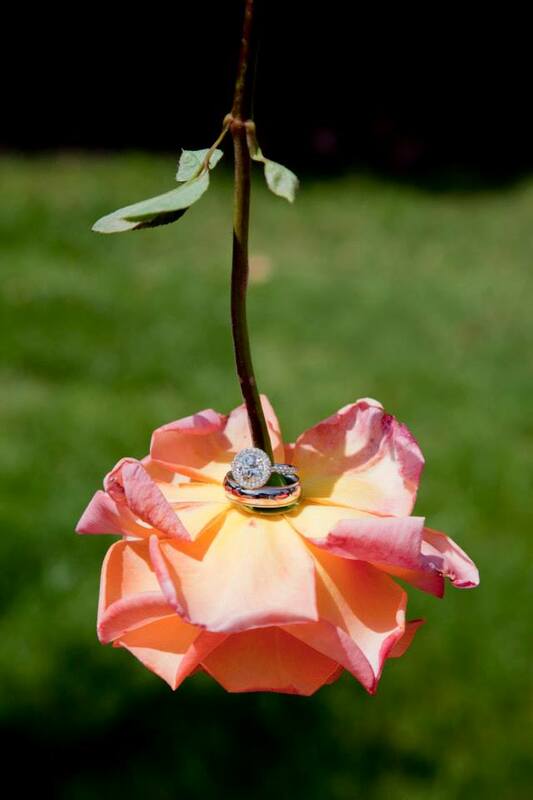 Your ring may be unique and full of character and diamonds. The guys don’t go that way. But you can elevate his ring with the special-ness of an inner message. And you can seal it with a kiss! Jordana and Brian’s Wedding Rings. Calla, I had no idea you could laser engrave something like a lip print onto a ring! What can’t you inscribe with laser engraving? Calla, I just have spent about an hour on your site. Once I hit your blog I just started reading and learning. But this laser engraving of a kiss takes the cake. I never heard of such a thing and love that the technology is there. Like, right now!